[prMac.com] London, United Kingdom - Storage Made Easy today announced that they have built a fully fledged PDF Annotation suite into their self-hosted enterprise file sync and share fabric product. The workflow of using the PDF Annotation feature is very straightforward. Users upload or choose a PDF from the private/public cloud of their choice (SME supports over 50 connectors). Users are provided with a version of the same PDF in the browser, which can then be annotated with stamps, notes, highlighting, redaction, text, and a signature tool. Annotations can be saved and also burnt into a new PDF document. If the PDF is in a team folder then users will see, and can work against annotations from other users, which are clearly marked as to whom the annotations were made from. Also when annotations are made, or deleted, this is recorded in the SME Audit Log, available to Administrators, for governance purposes. SME CEO Jim Liddle said, "Other companies that provide this functionality normally provided it stand alone and use a Flash viewer which many enterprise companies prevent from being used in the browser. 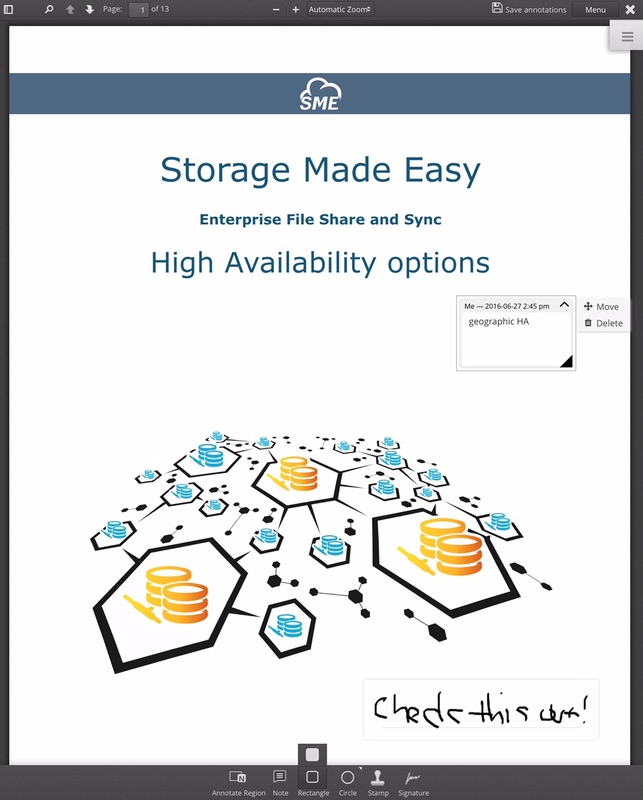 Storage Made Easy has made this easily available using HTML5, within its enterprise sync and share product and which is available for OEM integration in addition to direct corporate and service provider use." The feature is immediately available for testing with a free hosted business trial account and is also available in Enterprise on-premises Appliance versions 3.2.x and up. Storage Made Easy is wholly owned by Vehera Ltd., a private London-based limited company. Storage Made Easy provides a cloud service data broker platform and related services either as SaaS or a hybrid on-premise solution. Storage Made Easy unites cloud and data services into a single environment, guaranteeing file access no matter the location or device while providing the highest levels of management, security, compliance, audit, and access services. All Material and Software (C) Copyright 2016 Storage Made Easy. All Rights Reserved. Apple, the Apple logo, Macintosh and macOS are registered trademarks of Apple Inc. in the U.S. and/or other countries. Other trademarks and registered trademarks may be the property of their respective owners.